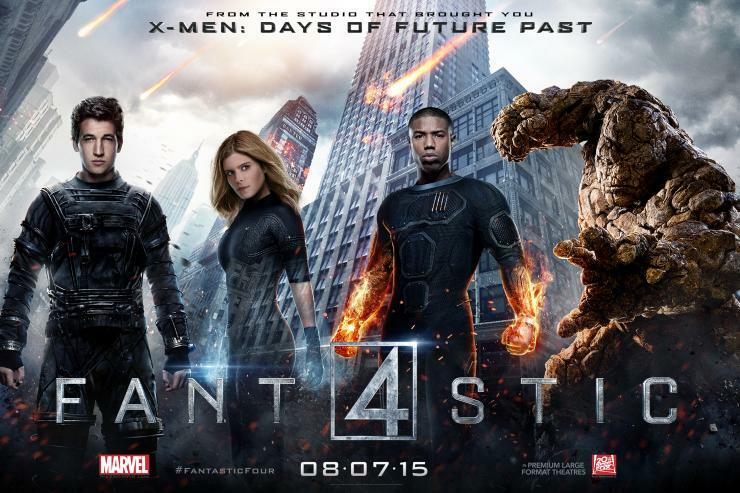 I disliked FOX’s Fantastic Four reboot so much I couldn’t even come up with a clever title to head up this review. After sitting through the 105-minute “film” I can only say that director Josh Trank, who co-wrote the screenplay with Simon Kinberg and Jeremy Slater, definitely tried something new…and it almost worked. Unfortunately a rushed final battle, sloppy characterization and plot holes undo any good will that was built up prior to the movie’s ensuing climax. Heavily influenced by Mark Millar, Brian Michael Bendis and Adam Kubert’s early issues of Ultimate Fantastic Four, the latest celluloid iteration starts off with a ten year-old Reed Richards trying his hand at matter transportation. Enlisting the help of classmate Ben Grimm, whose family owns a salvage yard that has components that Reed needs, the two soon find themselves doing what many told the young scientist was impossible. After several years of working and perfecting his science, Richards (now a young man at seventeen) catches the eye of Dr. Franklin Storm and his daughter Sue at a local science fair when he accomplishes what others could not – transporting AND retrieving matter from an alternate dimension. Reed is then asked to come and work on the Quantum Gate project with Dr. Storm and his team at the Baxter Building, a think tank of the brightest young minds looking to make a difference in the world. Also enlisting the help of Victor Von Doom, a former student with a chip on his shoulder that actually discovered the matter transportation science before Reed did, and Dr. Storm’s son Johnny, a mechanically inclined thrill seeker, the students at the Baxter set about to create the gateway that will allow people to cross over the threshold to another dimension. When success finally comes in the form of safely transporting live bio-matter to and from the alternate dimension, the young geniuses soon have their dreams crushed. They won’t be the ones to make the initial trip over, as the government may now take over their research. Unwilling to let history forget who truly made it possible, Reed, Victor, Johnny and Ben (who gets reluctantly pulled into this endeavor by his childhood chum) make the jump to the alternate dimension, called “Planet Zero” (but which astute comic book readers will recognize as The Negative Zone). That’s where things go pear shaped. A flare-up on the foreign soil seemingly kills Victor and imbues the three young men and Sue (who was helping bring them back from the Earth side of the gate) with incredible powers. But this film takes an atypical route from the comics. Instead of banding together, these four fall apart at the seams from the word “GO.” Waking up in a military installation, Reed abandons his friend Ben in his greatest hour of need as he’s turned into some kind of hideous rock monster. Meanwhile Sue is in a coma and uncontrollably phasing in and out of the visible spectrum while Johnny is in a state of constant combustion. Flash forward one year and Reed is still on the run while Ben is now a highly valuable government asset with Sue and Johnny supposedly being trained for the same. With the U.S. government keen on gaining access to Planet Zero once again, they need to find Reed Richards to help them breach the wall and break through to the other side one more time. This film had me at the beginning. As stated before, the nods to Marvel’s Ultimate universe were a nice touch and the real swerve of making three quarters of the team pseudo-black ops was something I wasn’t expecting. But the film asks you to make a lot of leaps of faith in terms of plot and character motivation. So Sue refuses to be a tool for the government but yet she lets them train her like a pet? And if Ben is still pissed at Reed for leaving him twisting in the wind and forcing him to become a wetwork killer, why does he seem like everything is all good in the span of a few minutes? How did they learn to control their powers? And if they still had all the original data from the computers and were able to recreate the Quantum Gate, why did they need Reed Richards at all? The film spent a little too long getting these kids to the point where they got their powers and then glossed over the initial growing pains of learning how to use them. It would have been nice to see a little of Ben Grimm’s despair at being turned into a freak or Sue’s analytical nature trying to make sense of her new powers. It would have been nice to see more of Johnny Storm period, as that was a character who got tossed to the backburner in a serious way. In a day and age when some comic adaptations overstay their welcome, Fantastic Four could have used about fifteen more minutes to flesh out the characters after they got their powers. The actors were all efficient in their portrayals but were lacking in depth and “oomph.” Miles Teller was not a convincing Reed Richards. I could buy him as a nebbish and awkward genius but not as the world’s smartest man. Kate Mara was a real ice queen as Sue Storm and I didn’t care for that. Michael B. Jordan and Jamie Bell were wasted as Johnny Storm and Ben Grimm, respectively. The team as a whole showed no signs of onscreen chemistry whatsoever, and that may be due to the fact that they barely had any time interacting with each other after they got their powers. And Toby Kebbell’s Dr. Doom was WAY too powerful. If he could pop people’s head like ripe fruit, why did he need to go toe-to-toe physically with the titular quartet? I just could not believe that the four heroes posed a real threat to him. And while we’re at it, it would have been nice if his powers were explained a little bit. Even if it meant Doom monologuing like a Bond villain, his horror-movie motives could have used a little clarification. While the special effects in regards to the team were spot on (I don’t think I’ve seen a better looking Thing on the big screen), Dr. Doom looked like a discarded action figure. And the backgrounds on Planet Zero looked unusually dull and flat. The effects team tried to make up for that with a lot of blowing dust or unnatural colors, but in the end it still looked like the actors were romping around in front of a giant green screen. If there is a sequel and they plan on making a return to the alternate dimension, hopefully the special effects crew can up their game a bit more. In a world where serious comic book movies are all the rage and the fun ones (Guardians Of The Galaxy, Ant-Man) are few and far between, I would have preferred if Fantastic Four had taken a more light-hearted route. The comic book FF are a family of explorers, having fun and adventures. This dark and dreary version showed us little in the way of what a real Fantastic Four movie should be. While not the visual abomination that was Roger Corman’s film or the weirdly unbalanced Tim Story versions, Josh Trank’s vision still didn’t get Marvel’s First Family right. In the end, Fantastic Four is not a blue ribbon winner. FOX was probably hoping for something akin to particle physics and the Large Hadron Collider, but the final product was something between a fizzling baking soda volcano and a potato powered clock that doesn’t work quite right. This entry was posted in Film, Reviews and tagged Fantastic 4, fantastic four, Jamie Bell, Josh trank, Kate Mara, Michael B. Jordan, miles teller, Toby Kebbell. Bookmark the permalink.